I know, I know, this headline sounds ridiculous. What could be more different than NYC and Yosemite National Park? When I moved to Yosemite for a three month volunteer position last summer, I definitely didn’t think any of my ten years of living in NYC would be relevant. Especially when you’re living an unconventional or nomadic lifestyle. After just a few days in the park, I started to notice some parallels between my life in New York City, and what I was experiencing in the park. Well, it turns out that living in these two places is quite similar, even though they look almost opposite at first glance. Let me explain. By now you’re probably aware that both of these places are crowded. New York City and surrounding towns in the metro area make up 10 of the top 11 most densely populated cities in the US. 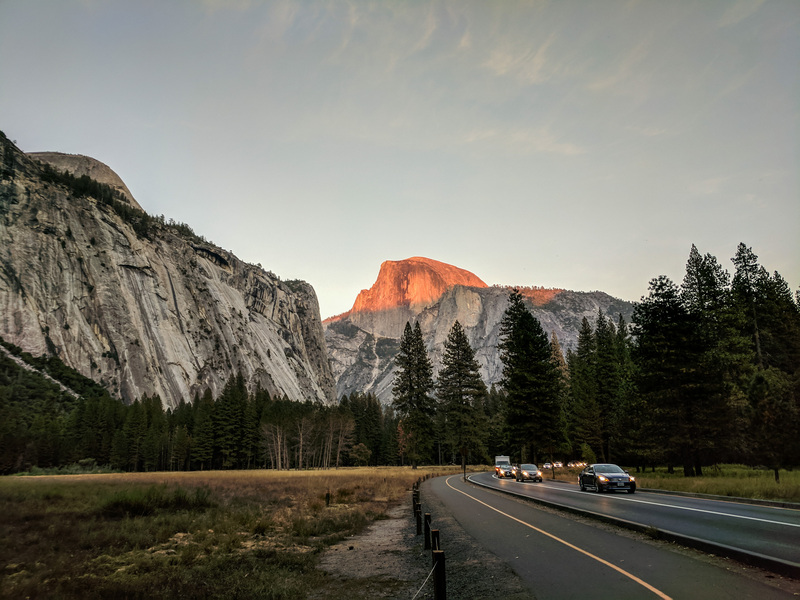 Meanwhile, Yosemite continues to smash visitation records each year, with most of those visitors crowding into the 1 mile x 7 mile Yosemite Valley. When you have a high population density anywhere, space is at a premium. The same goes for someone living in a tent! I had lived in teeny tiny apartments in NYC; I was fully prepared for living in a 100 square foot tent. Small living spaces are common in NYC and Yosemite! Anytime you put a lot of people in one place, you’re going to end up with a lot of traffic. Unfortunately NYC and Yosemite are both fantastic examples of this phenomenon. Especially in Yosemite Valley, where there’s a one way road in and a one way road out. NYC is not just densely populated, but is also one of the most diverse cities in the country. Yosemite visitors are a diverse bunch as well. Yosemite isn’t just a national park, it’s also a UNESCO World Heritage Site. This means it holds significance to people from all over the world, and attracts visitors from all corners on the globe. NYC holds a similar draw, and living in either one of these places puts you in direct contact with folks of all kinds of ethnic, racial and religious backgrounds. I learned this early on living in NYC, and the same holds true for living in Yosemite Valley. Anything I thought I would need for the day, I needed to pack and carry with me until I arrived at home in the evening. Both of these locations are spread out enough that I couldn’t just hop in my car and run home really quick to grab something I forgot that morning. This also includes staying on top of the weather so you know if you need an umbrella, rain coat, cold weather clothing, etc. Another reality of living in both of these places is an increase in cost of living. Food, drinks and other services are marked up for numerous reasons. Fortunately, the markups in NYC are higher than those in Yosemite, so it wasn’t as much of a shock! And there you have it! Seven reasons why living in NYC was (although I didn’t know it then) the PERFECT preparation for remote tent living in a national park. Who knows how your current lifestyle could be preparing you for a new adventure sometime in the future?! I’ve learned that living an unconventional life of adventure typically requires comfort with uncertainty. A great way to deal with that uncertainty is being able to pull from previous related experience. Additionally, I’ve learned that your past truly shapes who you become in the future. My parallel experiences in Yosemite and NYC really showcase this in a tangible way. I’m looking forward to seeing how my Yosemite experience shapes my future endeavors! This week, take some time to observe the world around you and see what parts of your environment might translate to other places, or think about how your previous experiences translate to your current situation. Share with me in the comments what you observe!